With the updated library, we thought it would be a great time to highlight the power of the new v2 features. So we created a sample application to do just that. The application uses the new Google Analytics Python client library to retrieve metrics for a series of segments. It then performs some calculations on the data and creates bar charts using the GChartWrapper package, an open source Python wrapper for the Google Charts API. Finally, it uses the Python Imaging Library to add a title and legend, and stitches all the charts together into a single image. We decided to release this application as open source so you can create visualizations with your own data. 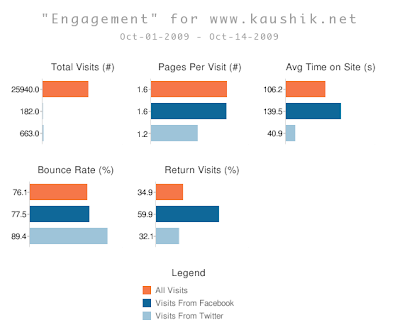 With social media all the rage, we wanted to use this new application to help Avinash Kaushik, our Analytics Evangelist, to measure "engagement" on his popular Occam's Razor blog. We also wanted to determine if the time he spends participating in social media sites is valuable and sends new readers to his blog. First we created segments to pull all the referrals from Facebook and Twitter. Second, we chose five calculations and corresponding metrics to compare the performance of thee two segments. We then compared the segments to each other and, for context, to all the visits to the site as a control. Some interesting observations become apparent. Visitors from Twitter tend to be new visitors, a good thing, but they view fewer pages and spend significantly less time on the blog. On the other hand Facebook delivers an audience that is loyal. These visitors come back to the site more often and spend a significant time on the blog (compared to Twitter and all other visitors). The bottom line? Even though social networking sites are all the rage, they actually contribute very little to Avinash's blog. If this blog were a company, it would be wise to ensure the time and effort put into driving traffic from social media is proportionate to the actual volume of traffic and goal conversions from those sites. Hopefully this example shows how powerful our new features can be. If you're interested in running this report against your own data, the application is free and open sourced. Additionally, we made it really easy to change the metrics, segments, calculations and all the other visual properties to power your own visualizations. So please download it here and give it a whirl, we would love to hear your feedback. We know it's easier for developers to program in the languages they know. So we updated the Google Analytics API Python Client library with all the new API version 2 features and added reference exampels for both the Account Feed and Data Feed. Now it's easier than ever to automate your analysis workflow using our API. To analyze this, Bruno looked at how large people's browser windows were when they visited this page. His first key idea was to measure not the entire browser window, but just the client area -- no toolbars, status bars, or other chrome. 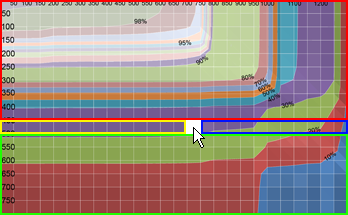 Using this visualization, Bruno confirmed that about 10% of users couldn't see the download button without scrolling, and thus never noticed it. 10% may not sound like a lot, but in this context it turns out to mean a significant number of people weren't downloading Google Earth. Using this data, the team was able to redesign the page to good effect. This turned out to be a good way to see which controls were and weren't visible at typical browser sizes. The only problem was, the overlay DIV prevented mouse events from getting to the page IFRAME, so it wasn't possible to interact with the page. Each of the outlines above (red, yellow, blue, green) represents a separate DIV. As the mouse pointer moves, we resize and reposition the DIVs to leave a small window of blank space around the pointer, and adjust background offsets for each DIV to make the overlay look like one seamless graphic. (We originally did this on a timer, but we found a simpler way: when the mouse touches any of the DIVs, resize/reposition all of the DIVs.) End result: a designer can click and otherwise interact with the page with the mouse, and thus interact with the site normally instead of repeatedly typing in URLs. We are now making this tool available to the public on Google Labs. 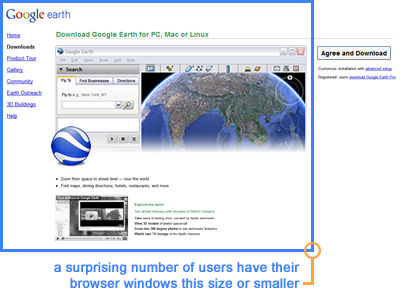 To try it, simply visit browsersize.googlelabs.com and enter the URL of a page you'd like to examine. 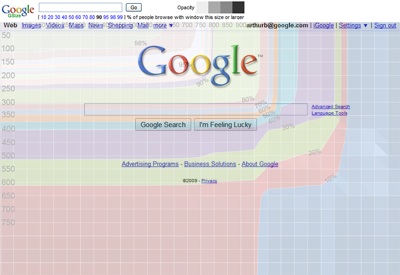 The size overlay you see is using latest data from visitors to google.com, so this should give you a pretty good indication of what parts of your UI are generally visible and what aren't. We look forward to receiving your comments at browser-size-external-feedback! When I started work at Google, I visited the Google Earth team, hoping to find a 20% project on my favorite Google product. There I met Bruno Bowden, who introduced me to a problem I had never thought much about: how to take browser sizes into account when designing a page. With advanced segmentation, you can look beyond the totals and into the nuances of the data for your site. For example, the average time on site for all visits could be 60 seconds, but when you segment by country, you might learn that average time on site of visits from Poland is over 2 minutes. With the recent Google Analytics v4 launch enabling up to 20 goals, many of you asked for access to this valuable data, and we listened. Now there are 48 new metrics to access goal performance. We've also added all the goal configuration data, including name, type, step names for each profile. Here's a great video describing the depth of the goal configuration data. All the details of this release can be found on our public changelog and public notify group. We've updated all our documentatation at http://code.google.com/apis/analytics. Please continue to give us feedback to improve our product through our public google group. The Translate element enables visitors to automatically translate your pages into their native language, extending the reach of your website to a global audience. Even better, it will know when their language doesn't match your site's. Have some multi-lingual visitors? Don't worry, they'll be able to turn it off completely. 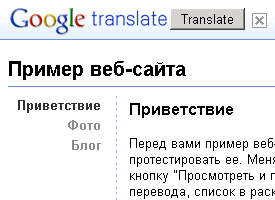 Note that whether or not the Translate element pops up is based on the language of your web browser. In order to test what other language visitors will see on your site, you'll have to follow the directions here to change your browser's language. 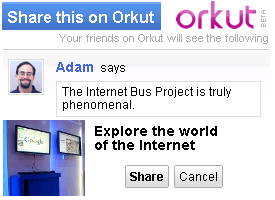 The Reader element embeds the headlines from your recent shared items on Google Reader right on your website. You can customize the element by choosing how many items to show and the color scheme. 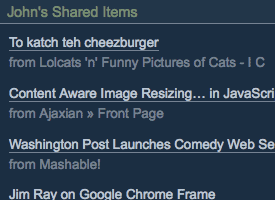 The headlines shown in the Reader element will automatically update as you share or unshare items. Login integration: The Google Web Elements website is now integrated with your Google account. By logging in (if you're not logged in already), you'll be able to more easily select your Calendar, Presentation or Spreadsheet in creating your element. Login is also required to personalize your Reader element. Document selector: Once logged into the Google Web Elements website, you'll be able to easily search through your data when creating a Calendar, Presentation or Spreadsheet element. All you have to do is click the "Choose" button and select the one that you would like to use with your element. You still have the option of pasting in a URL (for instance, if you wish to use a document not associated with your account), but this is no longer required. We hope you enjoy these new additions to the Web Elements family! To get started, check out www.google.com/webelements. Google Chrome Extensions launched in beta! Today, we launched Google Chrome's extensions system in the beta channel for Windows and Linux (Mac is in progress). We've also opened up our brand new gallery, which contains more than 300 extensions! You can also meet us in person - let us know if you want to join us in a small get together tomorrow on our campus in Mountain View (or via VC in New York and Kirkland). Space is limited - we'd love to see many of you there so RSVP early and we'll email you more information if you are selected to attend. You can also meet the team at Add-on Con, where we will participate in a couple of panels. Finally for those of you who are far away, we are planning some online developer tutorial sessions. If you are interested in attending, please fill in this form. You can transform your content into HTML files, protect sections of HTML from translation through the class="notranslate" attribute, upload the HTML files, share the files with your translators, download the translated HTML, and then transform and upload the documents back into your CMS. Automatically connect your file system with Translator Toolkit. You can create a cron job that uploads files into Translator Toolkit, shares the files with your translators, then downloads completed files back to the file system. For now, the API is available in labs as we rapidly add features based on your feedback. Check out our documentation, where you'll find our Java client library and a developer guide to get you started. Please visit our new developer forum if you have questions. Today, we're excited to announce the release of the Google Translator Toolkit Data API. Translator Toolkit is a powerful but easy-to-use editor that enables translators to bring a human touch to machine translation through translation search, bilingual dictionaries, and custom terminology databases. Using Translator Toolkit, you can translate HTML, Word, AdWords, Wikipedia, and other documents in a WYSIWYG ("what-you-see-is-what-you-get") editor, share them with other users, and download their translations onto your desktop. Automatically connect your content management system (CMS) with Translator Toolkit. You can transform your content into HTML files, protect sections of HTML from translation through the class="notranslate" attribute, upload the HTML files, share the files with your translators, download the translated HTML, and then transform and upload the documents back into your CMS. Did you hear that Friend Connect and Twitter are more closely integrated than ever? To learn more, check out our post on the Social Web Blog.